ABUJA – The suspended Chief Justice of Nigeria, CJN, Justice Walter Onnoghen, on Thursday, said he has no case to answer with regards to the six-count charge the Federal Government preferred against him before the Code of Conduct Tribunal, CCT, in Abuja. Justice Onnoghen, who is facing trial over allegations that he failed to declare his assets as prescribed by the law, as well as operated foreign bank accounts, contrary to the code of for public officers, insisted that FG failed to adduce any credible evidence to substantiate the charge. He secured the leave of the Mr. Danladi Umar-led three-man panel tribunal to file a no-case-submission, in line with the provision of section 303 of the of the Administration of Criminal Justice Act, ACJA, 2015. A no-case-application is entered in a criminal matter, when the defendant is confident that the totality of evidence produced by the prosecution, was insufficient to establish a prima-facie case capable of warranting the entering of a defence to the charge. Justice Onnoghen, who was suspended from office by President Muhammadu Buhari on January 25, indicated his intention to apply to be discharged and acquitted of the charge, after FG closed its case on Thursday. FG which had earlier notified the tribunal that it would call a total of six witnesses in the matter, however applied to close its case after it produced only three witnesses that testified before the CCT. The prosecution counsel, Mr. Aliyu Umar, SAN, maintained that it would be unnecessary to call the remaining witnesses. He said the defendant was at liberty to summon any of the listed but uncalled witnesses to testify on his behalf, if he so wished. FG’s lawyer was immediately overruled by the CCT Chairman, Mr. Umar, even as Onnoghen’s lawyer, Chief Adegboyega Awomolo, SAN, rejected the offer. “This is the case of the prosecution. If it feels that it is satisfied with evidence of the three witnesses, then so be it”, the CCT Chairman held. The case was subsequently adjourned to next week Friday for hearing of the defendant’s no-case application and for the adoption of the final written addresses by both the prosecution and the defence. The development came on a day the third prosecution witness, PW-3, Mrs. Ifeoma Okagbue, a staff of Standard Chartered Bank in Abuja, debunked the allegation that the suspended CJN operated foreign bank accounts. 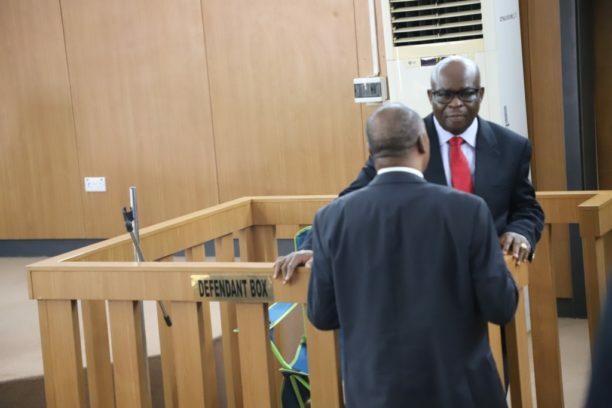 The PW-3, who identified herself as Onnoghen’s Relationship Manager, told the tribunal that contrary to what was contained in the charge, the five bank accounts that were linked to the defendant were domiciliary accounts that were opened at a branch of the bank at Wuse 2 in Abuja. Okagbue told the tribunal that she started managing Onnoghen’s bank accounts since 2015, even as she gave a load down of both the opening and closing balance in all the accounts, from January 2018 to January 2019. She said the accounts were all linked to one Bank Verification Code, BVN, adding that the bank had upon securing an approval from the defendant, diverted funds from the accounts into various profit yielding ventures. The PW-3 told the tribunal that profits that accrued from the investments were credited back into the accounts. While two of the accounts are in Naira, the three others were Pounds Sterling, Euro and Dollar accounts. Besides, the PW-3, said it was untrue that the defendant had either $1million or £1million in any of the five bank accounts she said were still active. She said the accounts were opened separately between 2009 and 2010, adding that the embattled CJN had used FG’s bond to secure $500,000 loan from the bank in January. She said: “On March 6, 2019, I was at the CCB office in Abuja based on an invitation that was extended to me. “A letter was sent to the bank to provide some documents to the CCB. The bank responded. Some of the documents included the account opening documents and the statement of account. “The owner of the account is honourable Justice Walter Onnoghen. He is the same person I had interactions with in the course of my duty. “The statement of account was in respect of five accounts. The first account number is 5001062686. It was opened in April 2010. “The second account with number 0001062667, was opened in June 2009. The third one, 0001062650, was opened in June 2009. “The fourth account, 5001062679, was opened in March 2010. While the fifth account with number 5002062693, opened in February 2011. “To the best of my knowledge, non of the accounts is dormant. I took over the management of the accounts in 2015, so I cannot recall their status before then. But as at now, all the accounts are currently active. “The statement of four of the accounts covered from January to December 2018, except the third account which covered from January 2018 to January 9, 2019. “As at January 2018, the opening balance in the first account was €30, 178.58, the balance as at December 2018 was €10, 187.18. “In the second account, as at January 2018, the opening balance was N6, 411, 312.77, as at December the balance was N12, 852,580.52. “The opening balance in the third account as at January 2018, was £39, 456.08 , by December the balance was £13, 730.70. “On Account number 0001062650, the opening balance as at January 2018, was $80,824.25, while the balance as at January 2019, was $56, 878. “I met the defendant sometime in 2015, in my capacity as the relationship manager. He was a client of the bank. “When an account goes dormant, it is my responsibility as the relationship manager to inform the customer of the dormant nature of the account and encourage the customer to reactivate the account. The bank can also send a notification to the customer. ” It applies to every customer of the bank, including our high-net worth clients. “I can’t recall if the bank had at any point in time, notified the defendant that his account was dormant. “I think the Euro is saving accounts. There are two Naira accounts, one is savings while the other is a current account. The Pound account is a savings account, while the US Dollar is a current account. “Based on confirmation from our compliance unit, the statements of account was forwarded to the CCB upon request”. Under cross-examination, the witness, said she had also given evidence before the National Judicial Council, NJC, based on an invitation from the EFCC. “I gave evidence there and was cross-examined. I also personally sent the account documents to the EFCC”. “As at January 2019, the defendant did not have $1million in any account he opened with our bank. He has a total of about 56,873,00”. The witness equally confirmed that the defendant does not have £1m. “The defendant had a loan facility of $500 that was granted to him by the bank. The security on the loan was his investment in federal government bonds and other investments. “The Pound, Euro and Dollar accounts were domiciliary accounts that were operated and managed here in Abuja by the bank. “The bank encouraged him as a disciplined account holder to invest in other money yielding investments. “Interest of these investments were regularly credited into his accounts”. Asked if the CJN ever withdrew money to purchase any luxury car, the witness said no. ” It was my bank that made investment on behalf of the defendant, using the credit in his account. “To the best of my knowledge, all the accounts have one BVN number”, Mrs. Okagbue added. Earlier, the PW-2, who is a retired Director at the Code of Conduct Bureau, CCB, Mr. Awal Yakassai, told the Mr. Umar led three-man panel that contrary to what was alleged in the media, he said the suspended CJN owned only five houses. The embattled CJN was said to have submitted the forms marked as Exhibit 2 and 3, to the CCB in 2014 and 2016. Answering questions under cross-examination, the PW-2, told the tribunal that he served at the CCB for 29 years before he retired in April 2018. He admitted that the CCB was yet to verify Justice Onnoghen’s assets with a view to finding out if he made false declarations. Holding the two documents in his hand while responding to a question from Onnoghen’s lawyer, the witness said: “My lord, according to exhibit 2 and 3, the defendant has only five buildings and not 55”. The witness told the court that verification columns on Onnoghen’s two asset declaration forms were still empty and unsigned. “As indicated here, the column for verified assets have not been signed as at today” he added, saying it was standard practice at the CCB that returned asset declaration forms must pass through three stages of verification. Yakassai who told the tribunal that he hitherto severed in a department of the CCB that receive asset declaration forms of public officers, said the suspended CJN submitted two assets declaration forms on December 14, 2016. Asked if he knows how many judicial officers were given asset declaration forms within the time he was in office, the witness said he could not recall. He said he was posted to the department that handle asset declaration of judicial officers, in November 2013. He said he could not recall the number of forms that were received from 2013 to 2016. He told the tribunal that all the asset declaration forms were archived at the CCB Chairman’s office. “It is not my personal responsibility as the Director to record all completed forms that are submitted to our department. We have schedule officers that do it. “All returned forms are kept under lock and key in most secured place at the CCB. “It is only with the permission of the Chairman that the forms can be accessed”. The witness said he was not aware it the CCB Chairman authorised the group that wrote the petition that led to Onnoghen’s trial, to have access, make photocopy or take away the Certified True Copy of returned asset declaration forms in custody of the Bureau. He said he was not shown a copy of the petition as at January 11 when one of the investigators, Mr. Simon Abu, took his statement. Nevertheless, the witness said he was shown photocopies of asset declaration forms that were submitted by Justice Onnoghen in 2014. Mr. Yakassai admitted that the petitionera quoted details of Onnoghen’s asset declaration forms, his account numbers, verbatim, indicating that they had access to the forms in custody of the CCB. Asked if he would agree that it is a criminal offence for anyone to hack into the archives of the CCB, the witness said he does not know. “Honestly I don’t know what happened here so I cant say anything about it. I don’t know if the CCB had ever reported to the police or any other agency that the CCB records were hacked into”. Onnoghen’s lawyer alleged that the CCB boss, who he said had blatantly refused to grant any one access asset declaration forms of certain top politicians in the present administration, was aware of the criminality of the petition and looked the other away. FG had insisted that it was the CCB that okayed Onnoghen’s trial based on certain infractions that were discovered in his asset declaration forms. In the charge marked CCT/ABJ/01/19, it alleged Onnoghen, had by his actions, violated section 15(2) of Code of Conduct Bureau and Tribunal Act. A senior investigative officer at the CCB, Mr. James Akpala who testified as the PW-1, had told the tribunal the charge against Onnoghen, was filed before his team concluded investigation on the allegation that he falsely declared his assets. Umar, who said he was displeased about “the distortion and misrepresentation” of what transpired at the tribunal last Monday by a section of the media, warned that he would henceforth wield his powers against journalists. “Henceforth, any journalist carrying concocted or discredited statement which is not adduced before this tribunal, I will not hesitate to bring the full weight of the law heavily on the person. “The journalist will languish there and may remain there (in prison) until I retire about 28 years from now. “It does not matter whether the contempt is committed in facie curiae (before the court) or ex facie curiae (outside the court)”, he fumed.